The first real rock climb in the UK. Was climbed solo by Walter Haskett-Smith in the 1890’s. 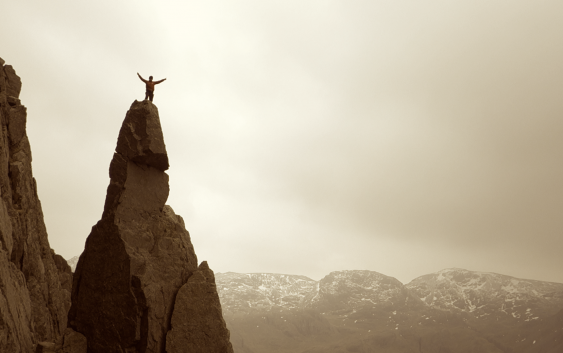 The photo of him stood on the summit would be the first dramatic image of this new sport. It was to set the Lake District and other mountainous places alight. I headed up to climb the route in the same style as the first ascentionist, and on a overcast and lonely day I made my ascent. Following in the footsteps of a pioneer. We offer guided rock climbing and instruction in the Lake District with our highly experience and qualified instructors and coaches. In particular we offer a historic weekend with the idea to ascend the Napes Needle the UK’s first real rock climb, Kern Knott’a Crack the UK’s first VS graded rock climb and then finishing on the second day with an ascent of arguably the first E1 in the UK, Central Buttress on Scarfell. The weekend cost £500 and this can be for up to two people.